April 7, 2018 By This post may contain affiliate links. 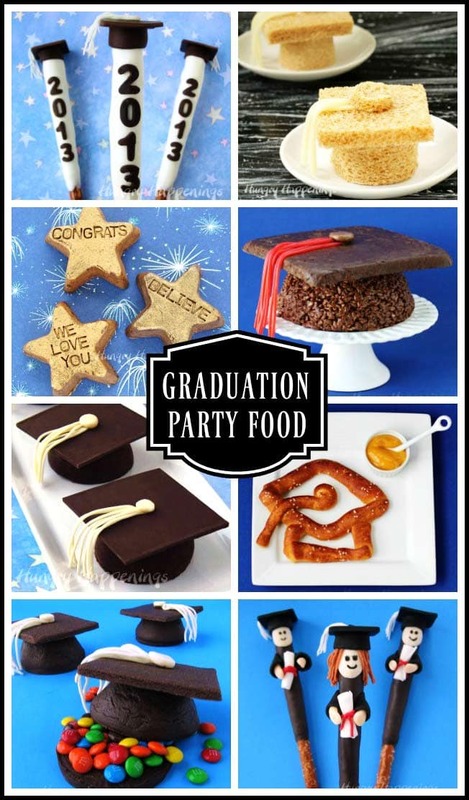 Make your commencement celebration extra special by serving Graduation Party Pretzel Pops. 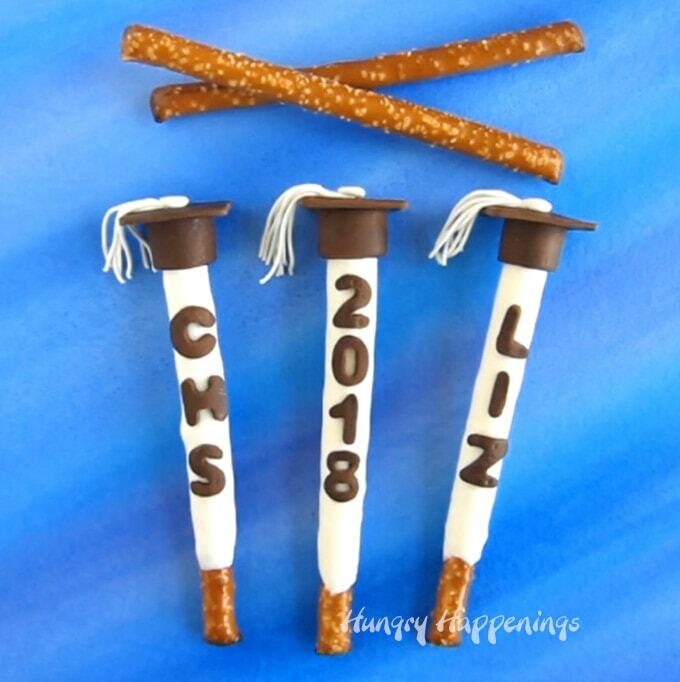 These white chocolate dipped pretzels decorated with modeling chocolate graduation caps can be personalized with the year of graduation, the school or the graduate’s name. Post originally published on May 17, 2013. 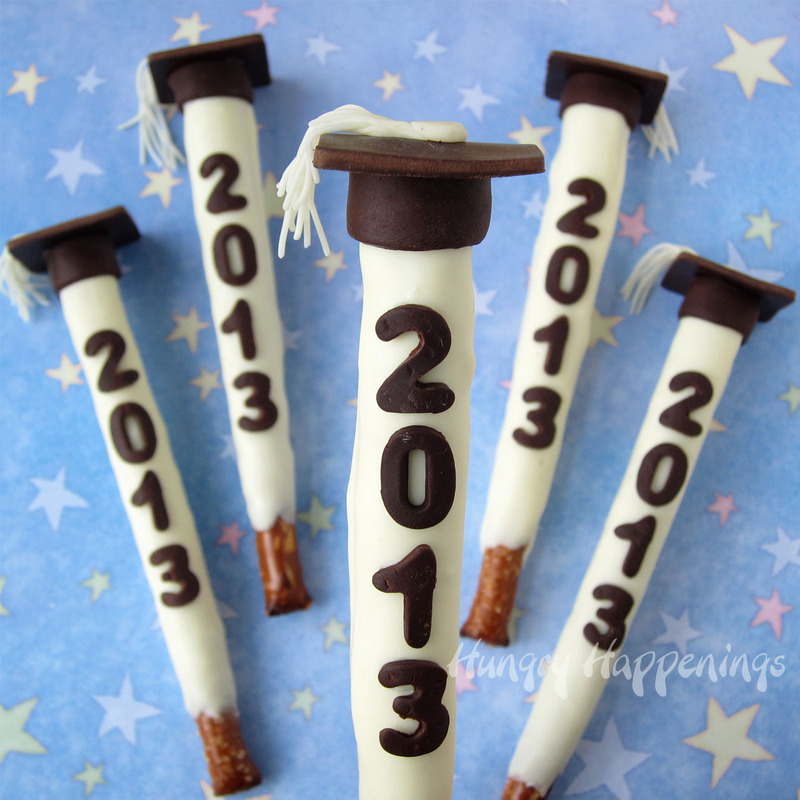 Whether you have a kid graduating from kindergarten or college, I bet they’ll love these graduation pretzel pops. I made them to serve at one of the many high school graduation parties I’ll be attending this year. 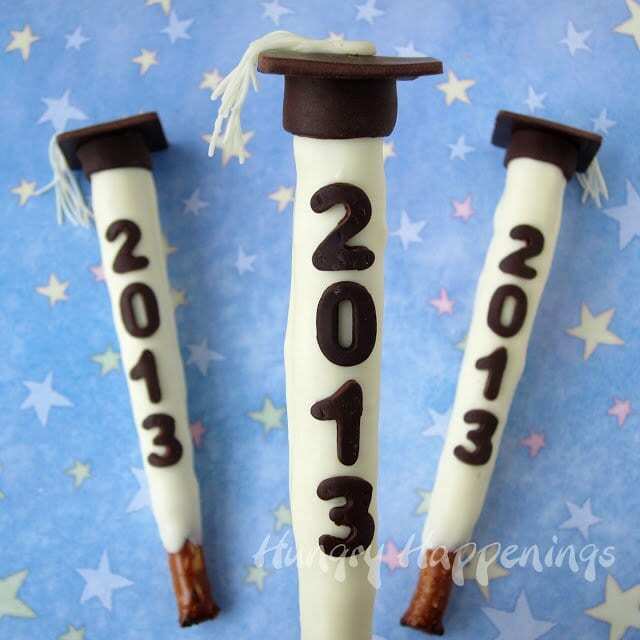 Each treat is made by dipping a pretzel rod into white chocolate then decorating it with a dark modeling chocolate graduation cap and the year “2013” (this, of course can be changed to the present year.) The chocolate pretzel pops can be served as dessert, used to top a graduation gift, or given as party favors. TIP to keep the chocolate from cracking on your pretzels. Chocolate shrinks as it cools and when it shrinks onto something hard, it might crack. If you take the pretzels out of the bag and allow them to sit at room temperature for several hours or overnight, they will soften just enough to keep the chocolate coating from cracking, but not enough to become stale. *See my Chocolate Making Tips page for information about the different types of chocolate and how to melt them. **I recommend you make your own modeling chocolate. It’s a simple 2-ingredient recipe. But if you don’t want to, you can purchase pre-made modeling chocolate. See the links below. 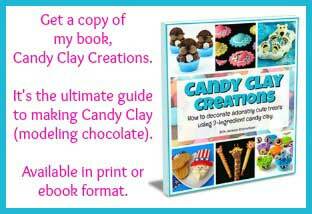 You can also find detailed instructions for working with modeling chocolate (candy clay) in my book, Candy Clay Creations. Instructions for decorating white chocolate graduation pretzel pops. 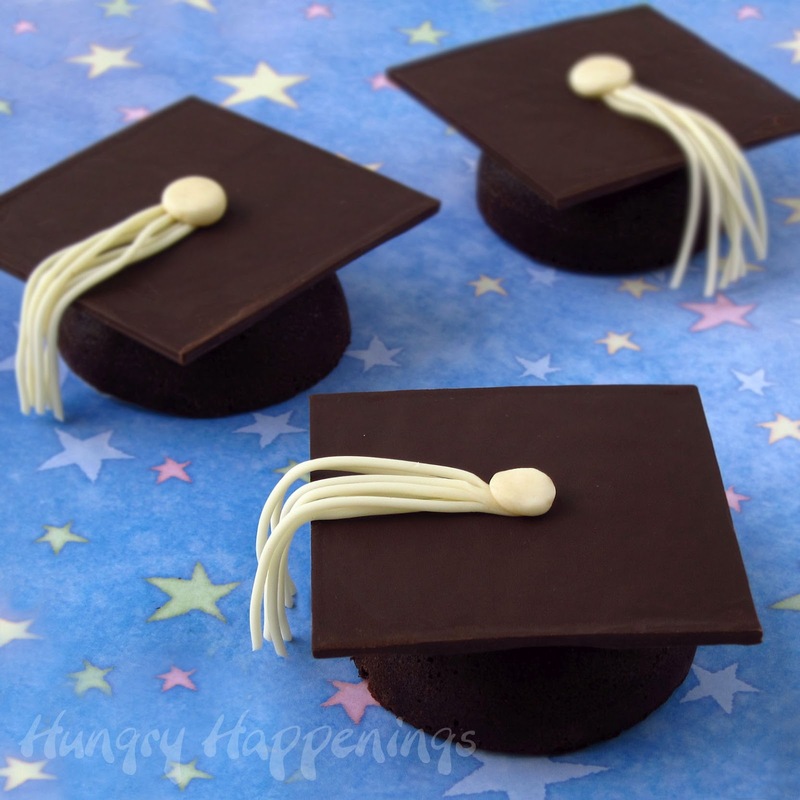 How to make the modeling chocolate mortarboard graduation cap and year. pinch off a tiny piece of white modeling chocolate, roll it into a ball, then flatten it. 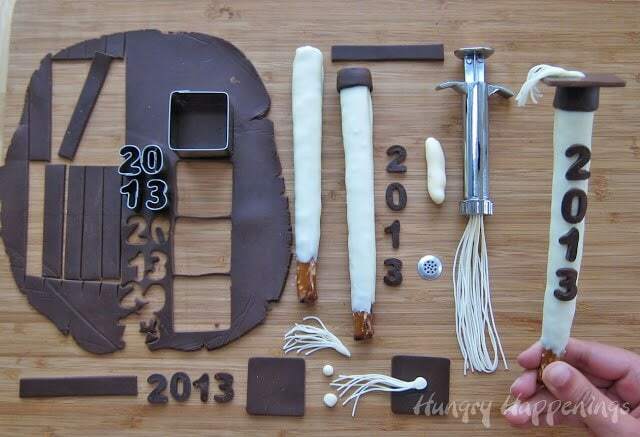 How to attach the modeling chocolate decorations to the white chocolate dipped pretzel. 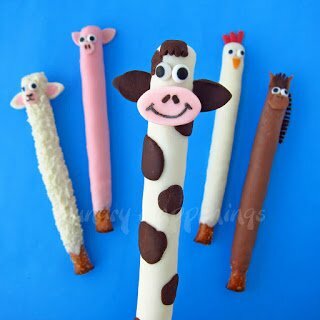 How early can I make these pretzel pops before my graduation party? 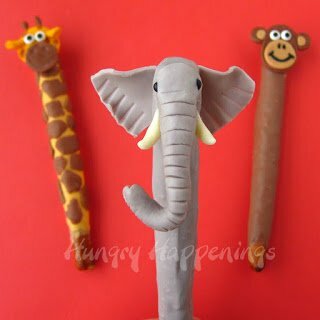 How should I display my pretzel pops at my graduation party? Can I serve these graduation pretzels if I’m hosting an outdoor party? 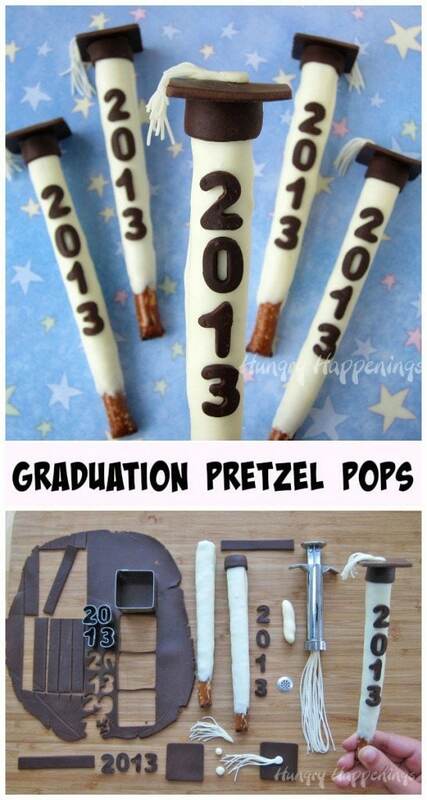 Can I give these Graduation Pretzel Pops as gifts? These are special 😉 It's always nice when things are personalized! I adored your animal pretzels and these graduation party pretzels are just as fabulous. Beth you are so busy, busy, busy..and awesome! I love this pretzel idea! These are adorable. 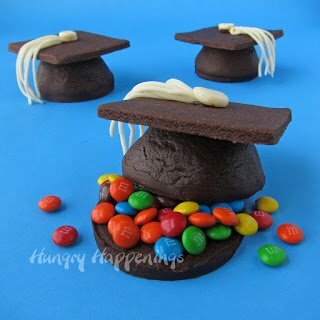 I think I'm going to make these for my daughter's preschool graduation! So cute! Pretty please share this on a link party that I host with 4 other blogs called Moonlight & Mason Jars (live Monday at 5pm EST thru Sunday at midnight). We feature 5 blogs who link up every week. Congrats Beth! We have featured this project on the Moonlight & Mason Jars link party this week. Thanks for linking up! Please grab our featured button when you get a chance! Thanks so much for featuring the pretzel pops. I'm so happy you all liked them. Hmm, I’m not sure why you couldn’t see the video. It seems to be working for me. Maybe refresh the page and try it again.